The compensation of the CEOs of the largest firms has grown much faster than stock prices, corporate profits and the wages of the top 0.1 percent. But the most dramatic difference is between the compensation of CEOs and the compensation of typical workers is that from 1978 to 2015 CEO compensation grew 941 percent while the compensation of a typical worker grew just 10 percent. The gap in pay between CEOs and employees can be illustrated by tracking the ratio of CEO compensation to that of the typical worker as shown in the figure above. CEOs of major U.S. companies earned 20 times more than a typical worker in 1965; this ratio grew to 30-to-1 in 1978 and 59-to-1 by 1989, and then it surged in the 1990s, hitting 376-to-1 by the end of the 1990s recovery, in 2000. The fall in the stock market after 2000 reduced CEO stock-related pay (e.g., realized stock options) and caused CEO compensation to tumble until 2002 and 2003. 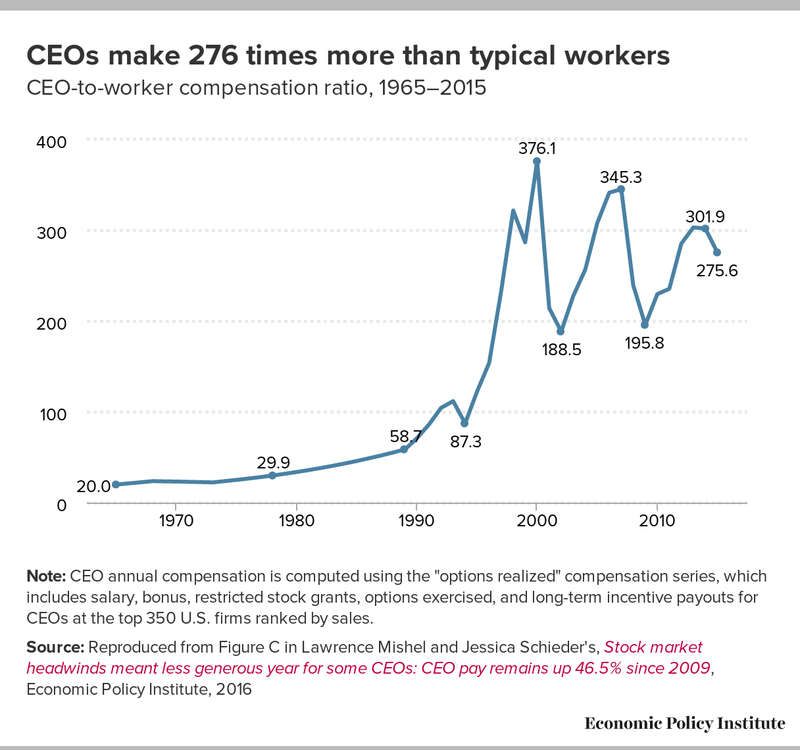 CEO compensation recovered to a level of 345 times worker pay by 2007, almost back to its 2000 level. The financial crisis in 2008 and accompanying stock market decline reduced CEO compensation after 2007–2008, and the CEO-to-worker compensation ratio fell in tandem. By 2014, the stock market had recouped all of the value it lost following the financial crisis and the CEO-to-worker compensation ratio in 2014 had recovered to 302-to-1. A dip in the stock market and the value of associated stock options led to a decline in CEO compensation in 2015 and, correspondingly, the CEO-to-worker pay ratio fell to 276-to-1, similar to what happened in other stock market declines at the start of the new millennium and during the Great Recession. Though the CEO-to-worker compensation ratio remains below the peak values achieved earlier in the 2000s, it is far higher than it was in the 1960s, 1970s, 1980s, and 1990s.